How to deal with OPs accepting answers they want to be right instead of ones that are right? In some questions, it appears people ask a question to get other people to tell them they are correct, or are heavily biased in favour of answers that say that their idea works. For instance, this question follows this pattern. Guy: Wow it would be cool if this existed! But I am not sure if it is in accordance with the rules! I will check on Stack! 50 people: This does not work. Other guy: Yeah, this works. Guy: I will make the other guy's answer right (because I want this to be true). This rewards incorrect answers, such as the -2 accepted answer in the example. What is the correct way to deal with this? Should I ignore it? 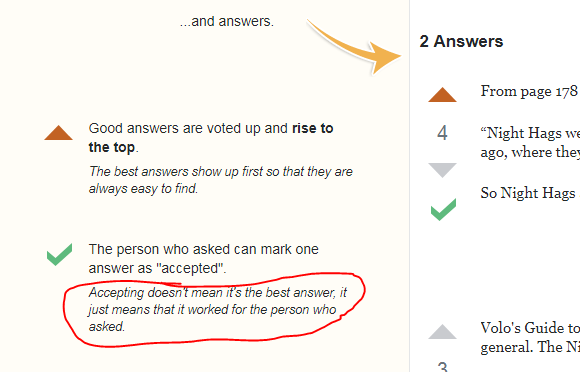 Unfortunately for the hapless souls who offer that "yeah this works" answer when it's wrong, the usual resolution communities use is to downvote that accepted (but wrong) answer more heavily than it would usually see until it's very, very obviously wrong and that readers should keep scrolling, and because it's accepted they can't delete it. Other answers get upvoted. We can't control the checkmark though and only remove answers that have major quality issues beyond simply being wrong, so querents are free to accept whatever answer they want. We just have our votes. It's common on these kinds of questions that the querent will also get into prolonged argument in the comments of every single answer to their question that doesn't give them the answer they want, arguing why their original stance is valid and the answer is wrong. If you see that happening please flag it and the diamond moderators will clean up and tell them to cut it out. What they are doing is well within the scope set out by the guidelines / rules. It simply means that the author received an answer that worked for them personally. I wouldn't say you should ignore it, but you shouldn't let it cause you to write off a question / answer pair automatically either. Consider it when deciding upon how to cast your vote and see if it being helpful to the OP is enough to influence your decision, then vote as you see fit. Yes, you should ignore it. On this stack in particular, since it is about a gaming hobby and not about a medical question or computer codes that might end up in a public train, accepting that whomever asks the question likes a particular answer better than other answers is just fine. The votes will tell the rest of the story. And that's fine too, the stack working as it is supposed to. There are even badges for having X more votes than the accepted answer, such as the populist badge. It's not worth worrying about. Also, if something is flat out wrong you are likely to see a comment, with a lot of up votes on the comment, under either the question or the answer that was selected. That will be of help to future users. 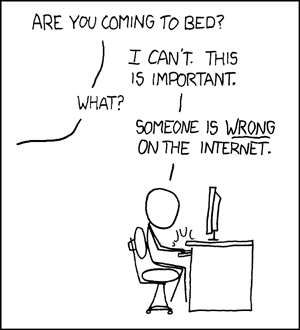 What isn't important is whether or not someone is wrong on the internet. my accepted answer is factually incorrect--no recourse? How to resolve the checkmark sitting on answers now made incorrect/inaccurate by rule changes/updates? Are questions about fantasy-football type games on topic? How to deal with questions that have no best answer? Should we correct rules references in questions? How to deal with answers based on the wrong system/edition?